What If California's Climate Law Gets Killed, Too? Yet coal companies see the battle over California's climate policy as a proxy for the ongoing battle over climate legislation in Washington, DC. The state's strict controls on pollution, energy efficiency, and workplace safety have often presaged similar federal laws. "Decisions made in California and other states have a tendency to spread throughout the nation, and that is something we cannot afford," notes a recent blog post on the website of the Adam Smith Foundation, a Missouri-based think tank that recently donated $498,000 to the California Jobs Initiative, the group spearheading Proposition 23. The foundation won't name its donors, though its blog suggests the coal industry is its main concern. "Coal is the cheapest and most sensible option for Missouri consumers," it says, "but it and other fuels that are readily available in the Midwest are the biggest targets of liberal environmental legislation." The Adam Smith Foundation is right to be worried. 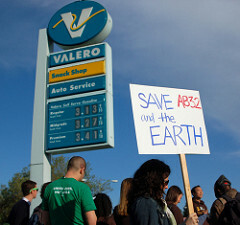 California has quite often been a breeding ground for environmental policies. The Clean Air Act can trace its roots back to an a small air-pollution agency founded in Los Angeles in 1947. The state has pioneered a variety of clean-energy measures, from white roofs to Berkeley's creative financing scheme for solar installations. And a lot of these ideas have ended up hopping to other states: It was Arnold Schwarzenegger's former environmental secretary, Terry Tamminen, who persuaded Charlie Crist to start cracking down on carbon pollution in Florida. The key point here is that in the past decade, there's been a significant outbreak of state-level climate policy. Renewable standards, efficiency laws, a utility-only carbon-trade system that's currently operating in the Northeast… And looking ahead, a number of Western states are watching California closely and mulling the possibility of linking up with its cap-and-trade system down the road. Assuming that Congress doesn't pass its own climate bill, then these states are going to shoulder a good deal of the burden in cutting carbon emissions. And California plays an outsized role. You can understand why the coal and oil lobbies are so desperate to stop it. That doesn't mean they'll be successful, though. As Nicole Allan reports over at The Atlantic, the environmental forces opposing Prop. 23 (i.e., the people fighting to preserve California's climate law) may be underfunded, but they have a few advantages. Most ballot propositions in California fail. And a lot of Republicans find it beneficial in California to take a pro-environmental stance—certainly Schwarzenegger decided that signing a climate bill would help him win re-election in 2006. Still, this is going to be a close call—and a significant election to watch.